Tonight is a stellar night. Tonight I got to meet my favorite blogger, which in itself wasn't revelatory - well, a little bit, she's a lot prettier and breathier than I expected (she has super long blonde hairs, like a human My Little Pony) - but it was super nice. I got to try to convince her to come talk at Google, and I gave her my email address. She complimented my belt. I had her sign books for me, for Mike's sister-in-law, and for my boss. All great. Stellar, even, since I've committed to that adjective. But the best part...wait for it...was waiting in line. I bought my copies of the book in the tiny Omnivore Books, then waited in line for 30+ minutes to get Heidi to sign them. There was plenty of wine, and I made friends with the people behind me. One had the most appreciative laugh I've ever heard. I want to record her for my own personal life-affirming laugh track. And turns out another knew a Wellesley chick that also just happened to be there, and the other is an editor at McSweeney's. Oh. my. god. The whole thing was just great. I made friends, I met someone I respect very much, I bought some books for other people that will (hopefully) make them happy. Then I came home to two text messages, from two friends that are going to be roommates soon, in New York. And I introduced them! 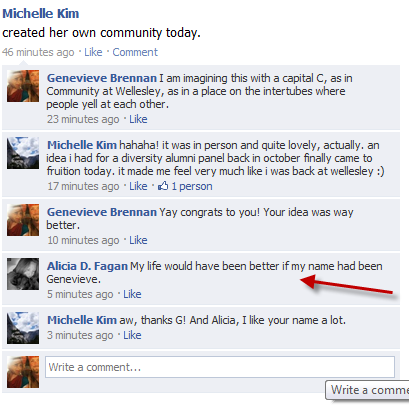 My sense of friend-parental pride could not be greater. The Facebook isn't for everyone, and it isn't for me all the time. But this is the kind of stuff that gives social networking whatever good name it has. 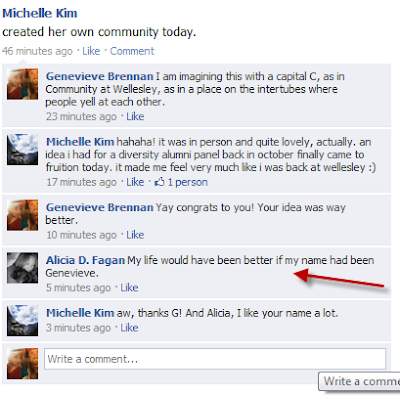 Alicia D. Fagan (rough name, seriously - the Oliver Twist association isn't ideal), I thank you.